Everyone in Bord na Móna is extremely proud of its 75th anniversary and of the efforts of the current and previous generations of employees in making the company what it is today. To celebrate and mark this major milestone, Bord na Móna has created an exhibition called “Heartland”, launched a heritage website – www.heartland.ie and revamped the company archive. 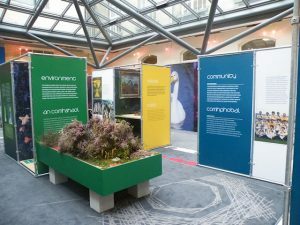 The items on show in the exhibition consist of artefacts, images and information relevant to Bord na Móna’s technical and social as well as economic development over the decades since the foundation of the Turf Development Board. There is also a glimpse into the future provided in a rather novel way. It has been a near impossible task to represent in this exhibition the story of Bord na Móna. So much has happened both within the company as well as externally that directly impact on our activities. In the end, we chose to convey merely a sense of what Bord na Móna has been about, through a selection of themes, portrayed through the combination of images, stories and artefacts. The exhibition was on display in Newbridge (Credit Union) in October and is in Tullamore during November/December. 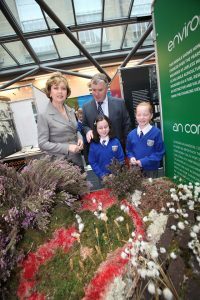 It is intended to show the exhibition next year in other towns near to Bord na Móna’s traditional heartland and details of these events will be made available in due course. A special edition of the popular RTE television programme “nationwide” was broadcast on Fri 18th September to mark the anniversary. This covered several aspects of Bord na Móna from the historical to present and future and included a good mix of community and culture. As part of the exhibition, a companion booklet has been produced and a complimentary copy has already been sent to each employee and pensioner. As well as the exhibition, a book on the history of Bord na Móna, aptly titled “Brown Gold”, will be published early next year. Chairman of the Board Fergus McArdle asked Donal Clarke (former company secretary) to write this history, to ensure that a public record would exist of the unique story that is Bord na Móna and to pay tribute to the enormous contribution that the company has made to Irish life over the decades. We have also developed a website www.heartland.ie to showcase Bord na Móna’s very rich heritage. This website not only has information about the exhibition and the history, but also contains sections on machinery and equipment as well as a list of people who have worked with us down through the years from the very beginning. This is a very interesting and worthwhile initiative and we encourage our employees and pensioners, their families and friends, to log on and discover more. A less noticeable but nonetheless important aspect of Heartland is the work being done to build up the company archive. A specialist archivist, Louise Kennedy, has been recruited to support Tony McKenna in this important and valuable exercise, aimed at collecting, recording, cataloguing and protecting key aspects of the company heritage. Already, a significant number of photographs have been collected and anyone who can supply more pictures, documents or items of interest should contact Tony McKenna or Louise Kennedy or any other member of the communications team.